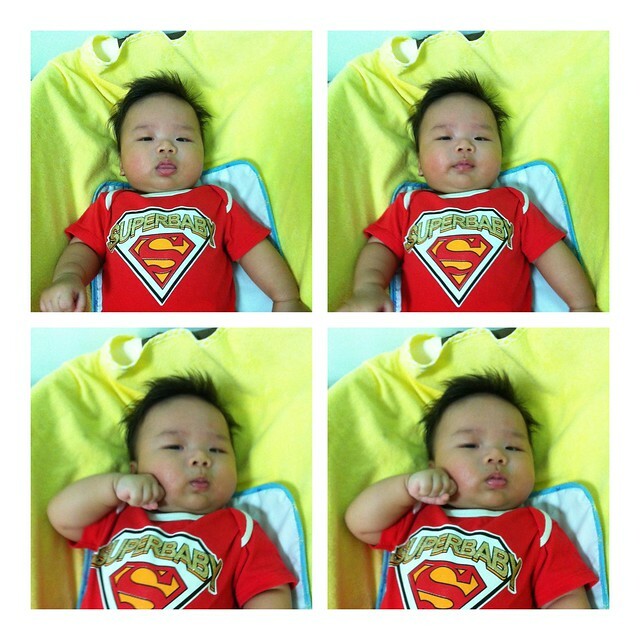 Some of my friends call my son Ah Huat. Here are some of his milestones – including daddy’s thoughts – in his first year that I want to ink into digital memory. Lil Pea was born. And what an adorable scrumptious Xiaodoudou he was! He’s a right little fighter too. I had to undergo emergency Cesarean section because he was in distress during labour: His heartbeat dropped from 140 to 90 to 60, and there was also meconium in the amniotic fluid, which is toxic if inhaled by baby. Friends and family prayed along with us for his safety. A healthy, happy baby – born with all fingers and toes. How’s that for a milestone! God is good. What a moment it was when the doctor handed him to me right after he was pulled out. That evening of fear and anxiety broke into joy and great relief! I counted his fingers and toes abt 8 times. By 1.5 months, Li’l Pea was sleeping through the night. Yes, we know just how blessed we are. It can take babies up to 6 months (and some even a year) to start sleeping through the night. 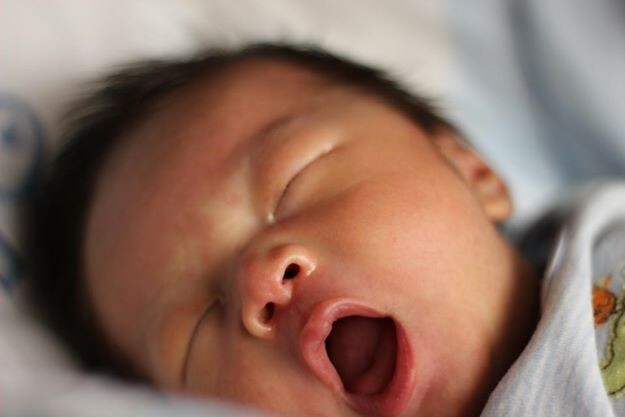 There are some things you can do to help your baby sleep through the night, including a sleep routine and sleep training. But that’s for another blog post on its own! Lil Pea was doing very well at breastfeeding and slept well – we couldn’t have asked for more. Right now, at 15 months old, he’s still a fully breastfed baby. Thank you, Xiaodoudou; and thank God for His mercy. Sleep deprivation, especially for a breastfeeding mum who has to nurse baby through the night, is no walk in the park. Yes he has been very kind to us. We who need much sleep. Before he was two months old, he started lifting his head up, for very brief moments. And he showed that he recognised mummy and daddy’s voices. We probably hang out together too much. Mummy was always the favourite. But I’ve been clocking in time with him and it’s paying off! No short cuts in parenting! I waited and waited for this to happen. It didn’t. Looking back, 2.5 months is a short time now, but seemed like forever then. He used to giggle in his sleep. But when he’s awake, daddy and I were mostly ignored. It’s just milk and diaper changes we’re after, thankyouverymuch. Then he finally shared his first social smile. The party is on! I soon realised that this is one happy little boy, who would smile and giggle through the worst of his eczema flare-ups when his face and body was covered in an angry red rash. 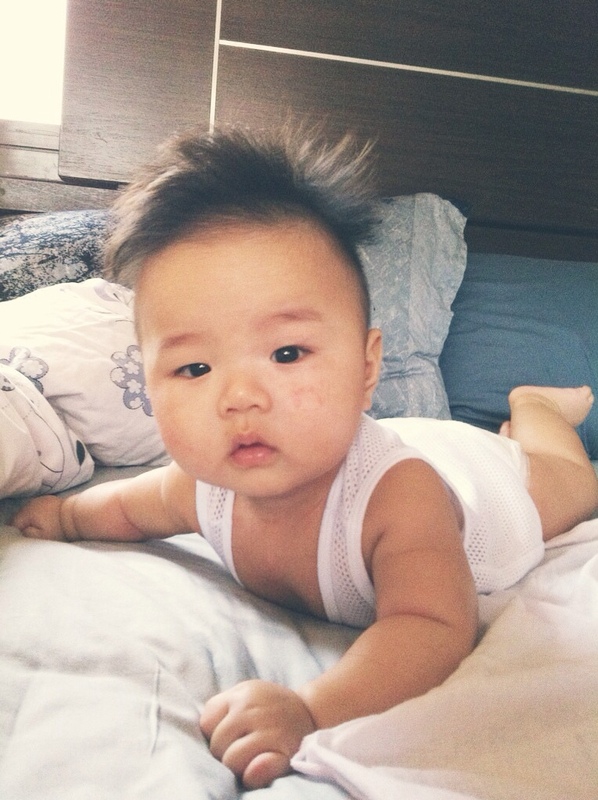 At about 3 months, we discovered that Lil Pea was allergic to something after his ears started weeping fluid and pus; then he was eventually diagnosed with cow’s milk allergy at 8 months. This is different from lactose intolerance. Of course he has his moments of frustration and tantrums. Sometimes he gets mungzang or fussy when he’s tired or hungry. But his easy smile made its appearance a frequent affair. I think his smile looks like mine! Many say it’s daddy’s no-eye smile! Mummy will have her own opinions about that, of course. 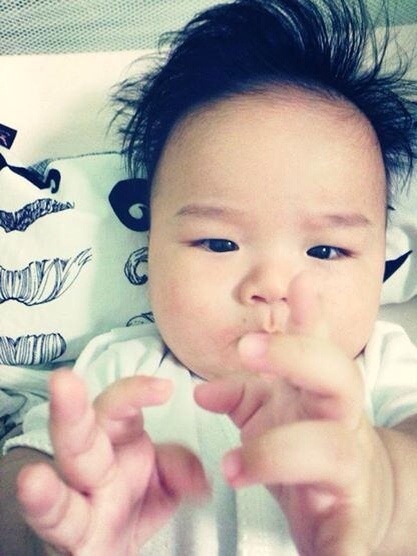 Now, if you’ve been facing a baby who has been doing nothing but just lie there like a little pumpkin, when he reaches out to grab something, IT IS AN EVENT. At about 4 months, he finally showed interest in moving toys and started grabbing and swatting them. Leading up to this game-changing event, Lil Pea was closely studying his hands and fingers, no doubt preparing for the big debut. But his pumpkin-state didn’t stop me from talking and interacting with him as if he understood me; babies are learning new things at every moment. They are linking ideas like cause and effect and object permanence, and are processing new concepts all the time. If you’re wondering why your baby has extremely fussy periods, you can read the book The Wonder Weeks. 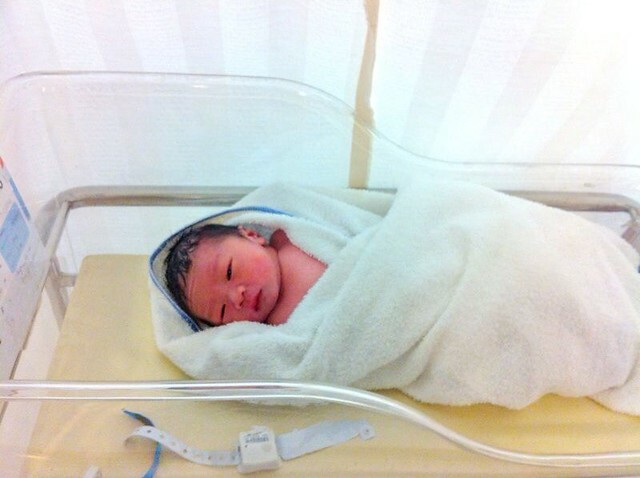 The premise is that every fussy period marks a developmental leap in baby’s exciting new world. Yes he will learn cause and effect. I’m in charge of the effects department, especially when things snap and break. He’s learning that we have stern tones too. Lil Pea hated being on his stomach, with a passion. He could happily lie in a dirty diaper, cooing and playing by himself. Loud noises? No problem. Strangers cuddling him? Bring it on. But roll him over onto his tummy, and he would start sobbing as if we told him sorry, there would be no more milk from now onwards. At 4 months, he finally rolled over onto his stomach, but the downside was, er, he didn’t know how to roll back. Oh, the screaming fits! I had to rescue him ever so often, because he kept practising and practising his new skill. You can imagine how proud he was of himself when he mastered rolling front and back. 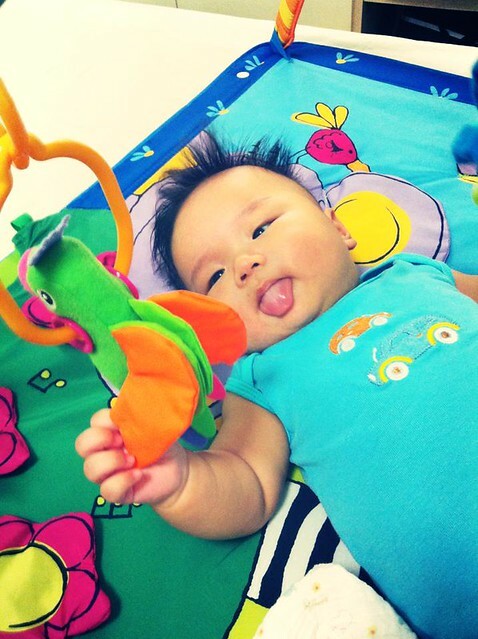 There are some exercises you can do during playtime with baby to encourage rolling over. It’s fun for baby, and interactive fun for dad and mum too. When we finally bought a playmat and put him on it, he mastered rolling back and front in a cinch. We should have gotten the bumper playmat sooner, because even young infants can spend time on it. It’s an important buy, the playmat. It’s like a holding area for him now. A thinly-disguised mini prison when mummy and daddy are busy. This is an important milestone for baby. Finally, he has the control of his motor skills to go places. His exploration of his new world just took another big leap. Lil Pea felt compelled to chase after a rolling toy on his playmat, and wobbled with great concentration as he reached for the toy. 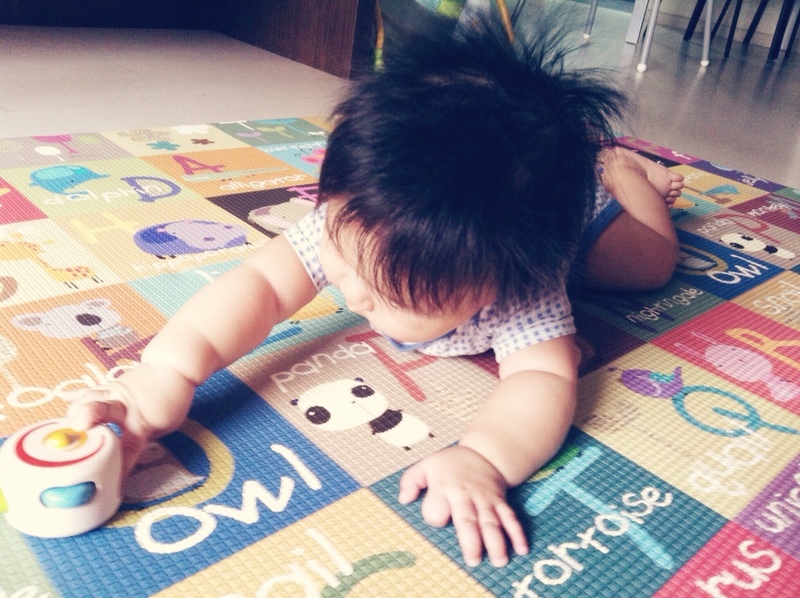 Soon he was crawling like a pro. Don’t rush baby into crawling, or rush him from crawling to walking. When baby is ready, he is ready. But it’s okay to encourage him, as much as he is willing to, and help him along with exercises to strengthen his core muscles and his leg muscles. I love Baby Led Weaning, or BLW. It simply means that we let baby feed themselves from the get-go when introducing solid foods; this means, no purees or mush! The term was coined by British health visitor Gill Rapley in her book Baby Led Weaning. At about 6 months, when baby shows signs of readiness to start solid foods, you can start. 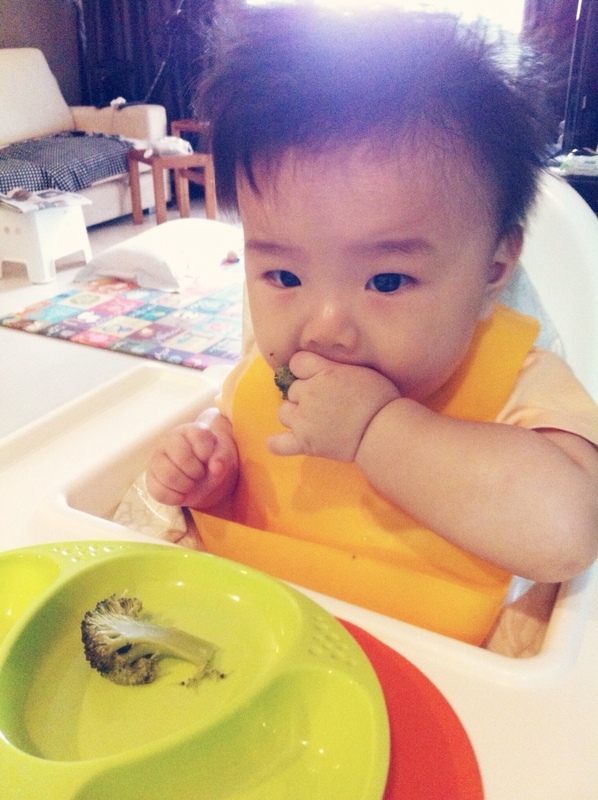 I have been doing BLW with Lil Pea when I first introduced him to solids. Now he is 15 months old, we are both still loving it. Finger-sized foods like sticks of cooked carrot, sweet potato, pumpkin, apple, peach, avocado; florets of broccoli, and even meat (later on). I don’t care much for BLW purists – I just do whatever suits my family’s lifestyle the best. So I did both traditional puree/porridge, as well as BLW finger foods. I want to be able to feed my baby porridge when we are out and about. Just like in breastfeeding, follow baby’s cue – when he is full, stop spoonfeeding and do not force him to eat.The rule of thumb is – do what is best for baby and your family’s lifestyle. There is no one-size-fits-all. A caveat: BLW is a LOT of cleaning up, because making a mess at mealtimes is part of the fun of exploring the world of new foods. Brace yourself! Another thing – Gill Rapley’s recommendations are based on mostly anecdotal evidence and her own experience, and one study (which I wasn’t so excited about). But more studies are being done to follow up, which are yielding pretty good results. See my other posts on BLW to formulate your own opinion. More on Lil Pea’s journey in BLW here. See our experience with common anxieties in BLW here. We see that he eats like Daddy!! Strangely, the first tooth came – and stayed – without much fanfare. None of that dreaded diarrhea, fever or drooly hoo-ha. I suppose Lil Pea reaped the benefits of the first tooth the most, when it arrived at 7 months. He could attack a raw apple with gusto. And oh, the fanfare came after the first tooth arrived. Because 5 other teeth decided to join in the fun. So poor Lil Pea had 6 teeth coming out together at about the same time. Yeah, he fussed a bit, but not much. Except that he has started to bite people. We do teach him that it’s wrong. Won’t want that to happen on a football field! Okay, so we probably chose a bad time to take Lil Pea for his first trip overseas, to Melbourne. Gone was the happy baby who would fall asleep playing by himself in his cot and wake up cooing at 10am the next day. This new baby, at 8 months, wanted to be cuddled to sleep. Let’s just say there were tears. And he would wake up at 6am asking to be cuddled and fed. Thankfully, he was perfectly fine during the plane trip to and from Melbourne. 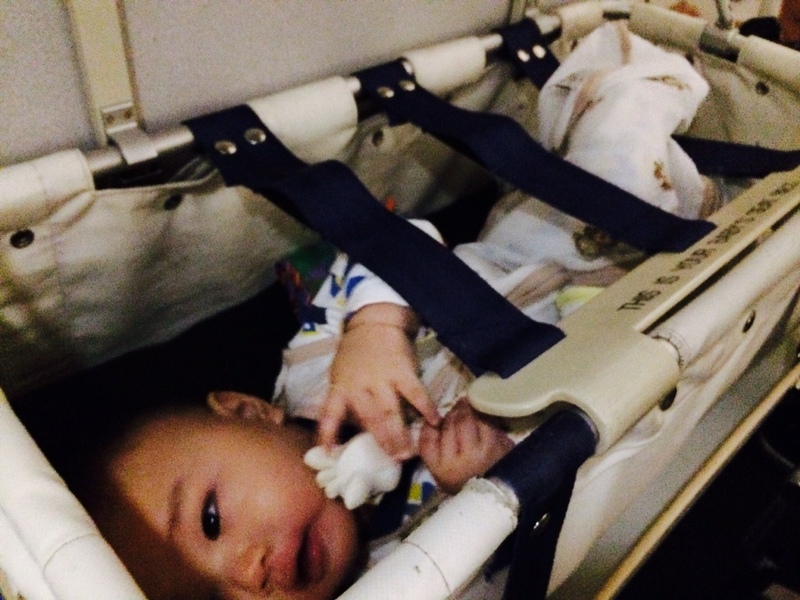 Even in the plane’s bassinet! 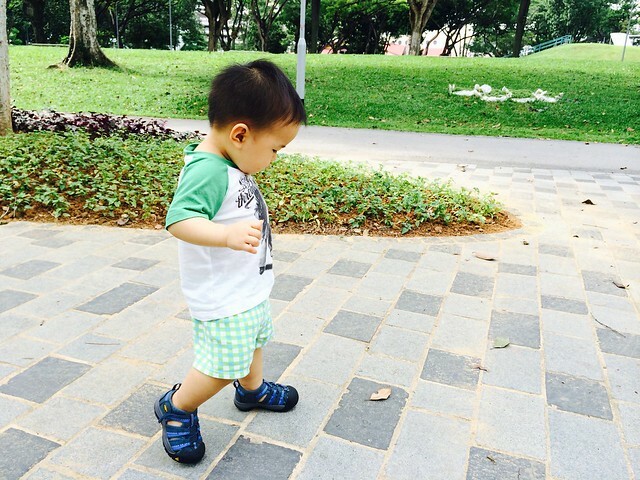 When we returned to Singapore, I realised Lil Pea was showing signs of pulling himself up to a standing position. And he would pull himself up and become frustrated and scared because he didn’t know how to sit down after that. He would do that in the middle of the night! I had to keep rescuing him. After reading up, I realised that 8-10 months is a common period for sleep regression, because baby’s little world is changing leaps and bounds with his new developmental skills. When he finally pulled himself to a steady standing position, he was so proud of himself as we cheered him on. After a few weeks, he started cruising. You can bet that Lil Pea was delighted with his new-found mobility, and was soon scampering along the fence of his playard. And now – drumroll, please. The moment a baby becomes a real boy. 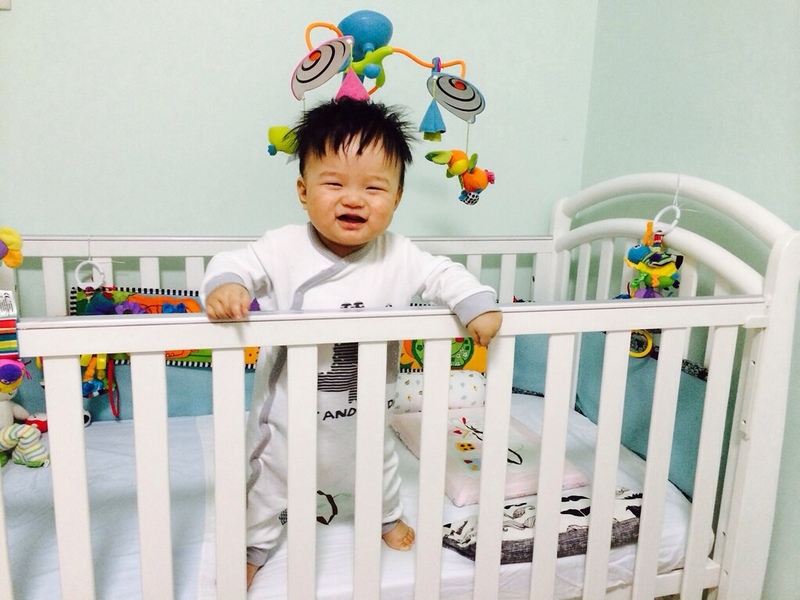 Lil Pea took his first steps when he was 12 months and 2 weeks old, giggling deliriously with every step. Our little explorer loves running about, pausing every now and then to inspect a new find. With his 85th percentile weight, you can be sure that mummy and daddy are glad to have some relief from carrying him all the time. Instead, now we are practising our cross-country chops chasing after him. Like I said, all’s fair in love and war. Chew, Peter. 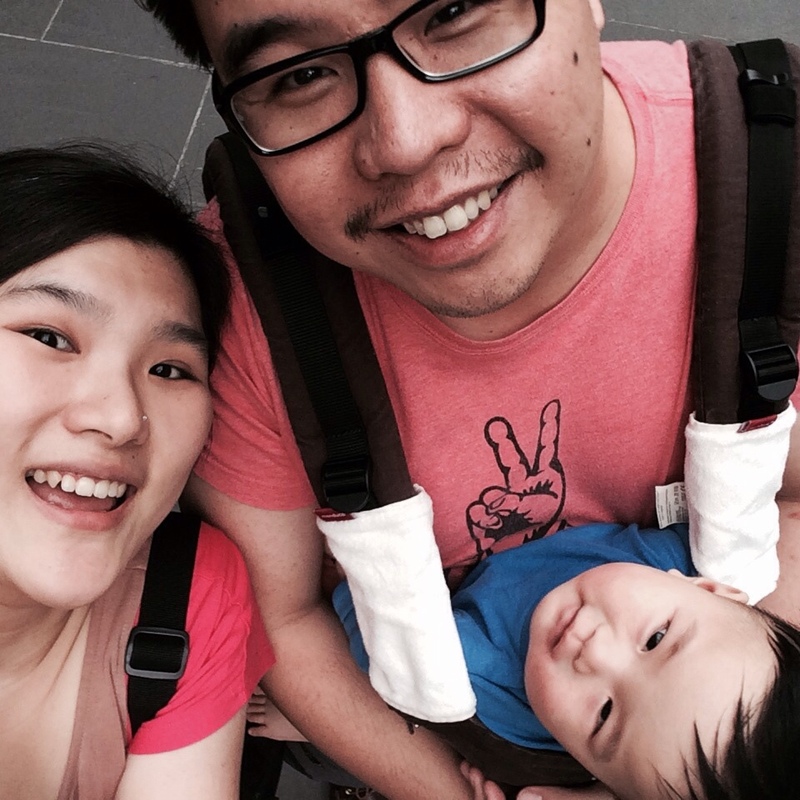 The essential guide for first-time Asian mums and dads from pregnancy to preschool. Singapore: Marshall Cavendish Editions, 2011. Ezzo, Gary, and Robert Bucknam. 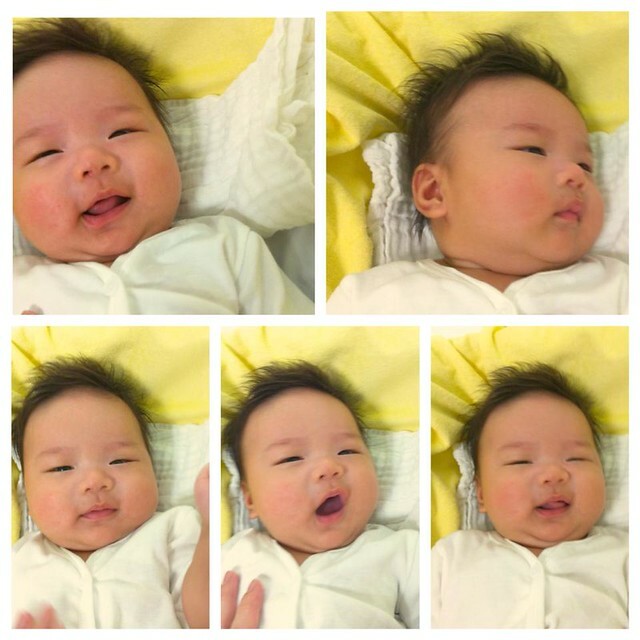 On becoming baby wise: giving your infant the gift of nighttime sleep. 4th ed. Louisiana, MO: Parent-Wise Solutions, 2006. Ford, Gina. The contented little baby book of weaning: your one-stop guide to contented feeding. London: Vermilion, 2002. Hogg, Tracy, and Melinda Blau. Secrets of the baby whisperer: how to calm, connect, and communicate with your baby. New York: Ballantine Books, 2001. Karmel, Annabel. Annabel Karmel’s new complete baby and toddler meal planner. 4th ed. London: Ebury, 2008. Karp, Harvey. The happiest baby on the block. New York: Bantam Books, 2012. Murkoff, Heidi, and Arlene Eisenberg. What to expect the first year. New York: Workman Pub., 2009. Rapley, Gill, and Tracey Murkett. 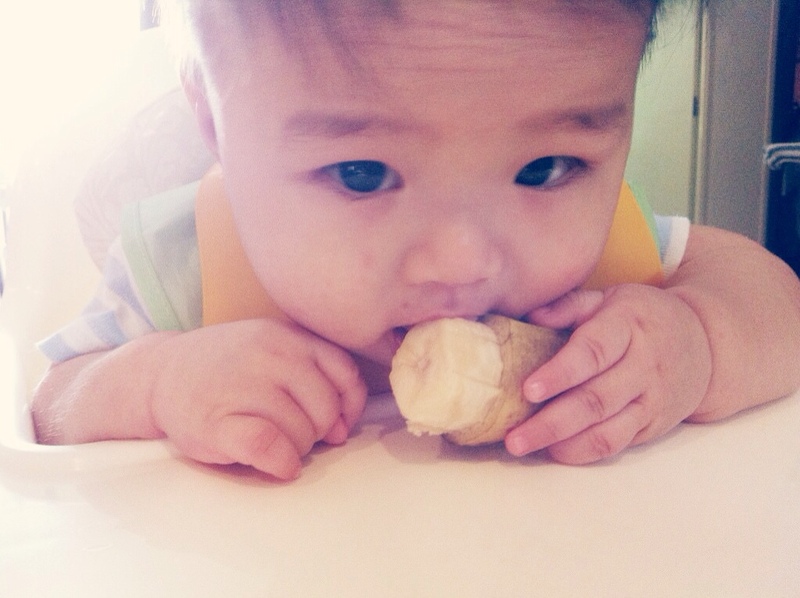 Baby-led weaning: helping your baby to love good food. London: Vermilion, 2008. Rapley, Gill, and Tracey Murkett. Baby-led weaning cookbook: over 130 delicious recipes for the whole family to enjoy. London: Vermilion, 2010. Sears, William, and Martha Sears. The attachment parenting book: a commonsense guide to understanding and nurturing your baby. Boston: Little, Brown, 2001. Vanderijt, Hetty, and Frans X. Plooij. The wonder weeks: how to stimulate your baby’s mental development and help him turn 8 predictable, great, fussy phases into magical leaps forward. Arnhem, Netherlands: Kiddy World Promotions, 2010. Wiessinger, Diane, Diana West, and Teresa Pitman. The womanly art of breastfeeding. 8th ed. New York: Ballantine Books, 2010. Wong, Boh Boi. Breastfeeding: your best gift to your baby. Singapore: Thomson Medical Centre, 2004. Wong, Boh Boi. Childcare: understanding your baby’s health and growth in the first year. 2nd ed. Singapore: Thomson Medical Centre, 2010. Yaron, Ruth. Super baby food: your complete guide to what, when and how to feed your baby and toddler. 3rd ed. Peckville, Pa.: F.J. Roberts Pub. Co., 2013.